Spotlight is Mac's built-in search system. It was first introduced in OS X 10.4 (Tiger), and then continuously refined with each update to OS X. Spotlight has become the go-to search system for Mac users. Most of us access Spotlight through its magnifying glass icon in Mac's menu bar. Because of its prominent location on the right-hand side of the menu bar, it's easy to click on the icon and enter a search string in the drop-down field (pre-OS X Yosemite), or in the central window (OS X Yosemite and later). Spotlight will dutifully find related content located on your Mac. But Spotlight is more than just a magnifying glass in the menu bar. It's the underlying search engine used throughout OS X for locating files. When you perform a search in a Finder window, it's Spotlight doing the work. When you use ​Mail's search feature to locate a specific email, it's actually Spotlight that's digging through your mailboxes to find it. You can control the way Spotlight searches and displays results with the Spotlight preference pane. Using the preference pane, you can customize the type of files that are included in a Spotlight search, what order they display in, and which folders and volumes you don't want Spotlight to search. We'll start by opening Spotlight's preference pane so we can customize its settings. Launch System Preferences by either clicking on its icon in the Dock (it looks like a square with sprockets inside it) or by selecting System Preferences from the Apple menu. With the System Preferences window open, select the Spotlight preference pane by clicking on its icon (a magnifying glass). The Spotlight preference pane will open. The Spotlight preference pane is divided into three areas; the main display area is in the center of the pane. Two tabs near the top of the preference pane control what displays in the center section. At the bottom of the pane is a section for configuring keyboard shortcuts. The Search Results tab displays the various file types that Spotlight knows about and the order they will be displayed in. It also allows you to select or remove file types from Spotlight. Spotlight knows about many different file types, including applications, documents, folders, music, images, and spreadsheets. The order in which the file types are displayed in the preference pane reflects the order in which search results that match a file type will display. For instance, in my Spotlight preference pane, your search display order starts with Applications, Documents, System Preferences, and Folders. You can control the order in which the results are displayed in a Spotlight search by dragging the file types around in the preference pane. If you often work with Word documents, you might want to drag the Document file type to the top of the list. This will ensure that documents will appear first in Spotlight search results. You can reorder the search results at any time by returning to the Spotlight preference pane and changing the order of the file types in the display. You'll notice that each file type has a checkbox next to its name. When a box is checked, the associated file type will be included in all search results. Unchecking a box removes the file type from Spotlight searches. If you don't use a file type, or you don’t think you will ever need to search for one of the file types, you can uncheck its box. This can speed searches up a bit, as well as create a list of search results that is easier to look through. The Privacy tab is used to hide folders and volumes from Spotlight searches and indexing. Indexing is the method Spotlight uses to be able to quickly present search results. Spotlight looks at a file or folder's metadata whenever it is created or changed. Spotlight stores this information in an index file, which allows it to quickly search and produce results without having to actually scan your Mac's file system every time you perform a search. Using the Privacy tab to hide volumes and folders from searches and indexing is a good idea for a number of reasons, including privacy and performance. Indexing can put a noticeable hit on processor performance, so having fewer data to index will always provide better overall performance. You can add folders or volumes to the Privacy tab by clicking the plus (+) button at the bottom left of the window and then browsing to the item you wish to add. Select the item and click the Choose button. You can remove an item from the Privacy tab by selecting the item and then clicking the minus (-) button. Items you remove from the Privacy tab will be indexed and made available to Spotlight for searching. 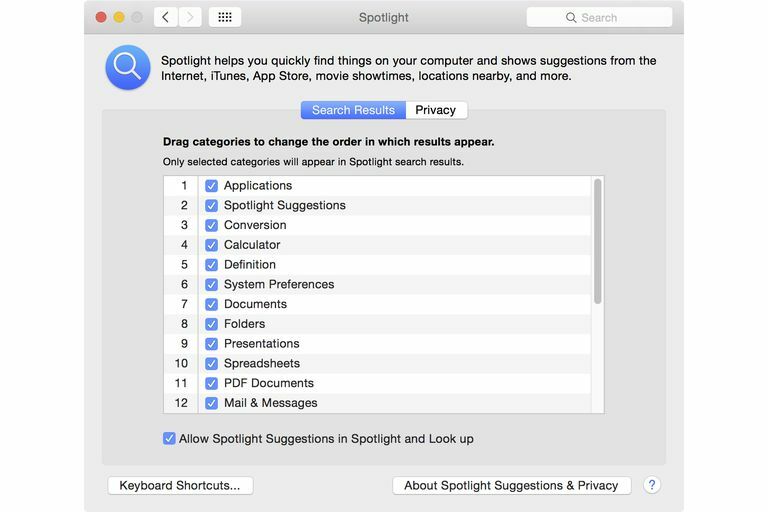 The bottom section of the Spotlight preference pane includes two keyboard shortcuts you can use to quickly invoke a Spotlight search from the Apple menu bar or from a Finder window. Spotlight searches from the menu bar will search anywhere on your Mac that is not included in the Privacy tab. Spotlight searches from a Finder window are limited in scope to the files, folders, and subfolders in the current Finder window. Items listed in the Privacy tab are not included in the search. To enable the keyboard shortcuts, place a check mark next to the Spotlight keyboard shortcuts you wish to use (menu, window, or both). You can also select the key combination that will access a menu or window shortcut by using the drop-down menu next to the shortcut. When you’ve finished making changes to the way Spotlight works, you can close the Spotlight preference pane.